UNIONS AND bus employers have finally agreed on an 8% wage increase for the first year and 9% for the second. Last night talks (Monday) finalised the end of a strike that almost ran for a month. “We’re announcing the end of the strike, which was painful for our community because workers had no choice but to down tools as employers were not willing to move an inch on improving wages of workers,” says Numsa general secretary Irvin Jim. More than 17000 bus drivers went on strike from April 18, demanding a 12% across the board while the employers were offering a 7% and 7.5% pay rise offer for the first and second year respectively. The workers, who are to return to work today, secured an 8% wage increase for the first year and 9% for the second. Zanele Sabela‚ spokesperson for the South African Transport and Allied Workers Union (Satawu) says they’re happy its all system go for busses to hit the roads as the strike has affected the economy badly. “Though we expect our workers to be back at on Tuesday, on Wednesday it will be on full swing,” she said. 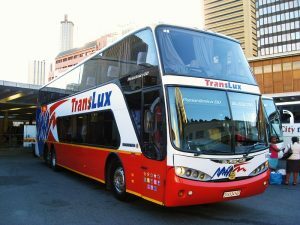 Tumisang Kgaboesele chief executive -Africa People Mover (APM), a black operator in the long distance bus industry, had also written a letter to President Cyril Matamela Ramphosa stating his concerns as an only black industrialist and intervention thereof. The end of the strike means there will be more busses on the road to ferry fans to the much awaited Nedbank Finals in Cape Town on Saturday May 19 between Maritzburg United and Free State Stars.